Unknown after Ian Hamilton, Portrait of Mrs Ellen Agnes Neame, date unknown. Collection of the Sarjeant Gallery Te Whare o Rehua Whanganui. Gift of Ellen Agnes Neame, 1942. As part of the redevelopment of the Sarjeant Gallery, each and every item in the collection is currently being inventoried and packed in preparation for its journey to Taupō Quay. 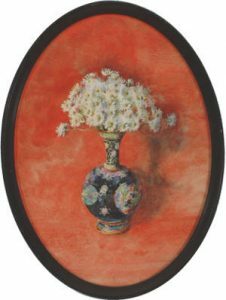 Among the many interesting works that I have encountered in the past three months are two small watercolours – one depicting a street in the Italian town of San Remo, and the other a still life with white daisies in a cloisonné enamel vase. What caught my attention in both of these cases was the name of the artist, Ellen Agnes Neame. As the wife of our founding patron Henry Sarjeant, Ellen’s name is often mentioned in accounts of the Gallery’s history but I was surprised to discover she was a painter in her own right. My curiosity piqued, I wanted to know more. Who was Ellen Neame and what do we know about her as an artist? Ellen Agnes Neame, The Cloisonné Jar, date unknown. Collection of the Sarjeant Gallery Te Whare o Rehua Whanganui. Born in Foxton in 1868, Ellen was the eldest daughter of John Tiffin Stewart, a prominent civil engineer, and his wife Frances Ann. In 1889, the family moved from Foxton to a 17-acre property at Aramoho in Whanganui. Three years later, at the age of 22, Ellen married Henry Sarjeant at Christ Church. After completing a two year tour of England and the Continent, the couple subsequently moved from Henry’s estate at Fordell to a residence on Bell Street. From this central location, Ellen became involved in a number of public activities, serving for a time as president of the local Plunket Society and, after 1901, on the committee of the newly established Wanganui Arts and Crafts Society. In February 1912 Henry passed away. In his will he bequeathed property valued at £30,000 in trust to the Wanganui Borough Council for the purpose of building and maintaining an art gallery. Taking an active role in seeing his vision fulfilled, Ellen took her place on the governing committee that oversaw the design and construction of the gallery building and, following its completion in 1919, acted as an advisor regarding the display of the fledgling collection in the galleries. 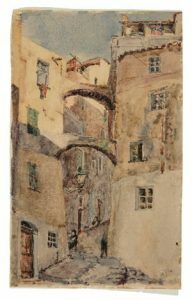 Ellen Agnes Neame, A Street in San Remo, date unknown (post 1913). Collection of the Sarjeant Gallery Te Whare o Rehua Whanganui. Gift of Lenore Stewart. Alongside her second husband, John Armstrong Neame whom she married in April 1913, Ellen also played a key role in acquiring artworks to fill these spaces. In addition to advising the committee on potential acquisitions, the couple made two trips to Europe between 1914 and 1921, sourcing works from artists and collectors in England, France, Italy, and Sicily. In contrast to Ellen’s role as a patron of the arts, relatively little is known about the work that she produced as an artist. An early influence may have been her father John who, in addition to being a skilled draughtsman, produced sketches in watercolours of many of the places that he visited on his travels. 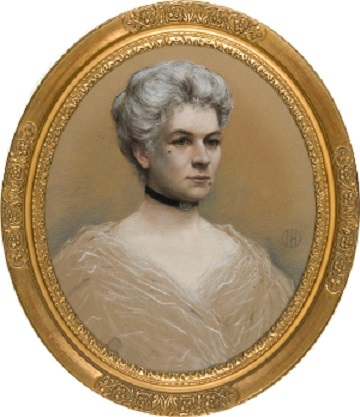 The earliest known reference to her own work dates to 1903, when some of her sketches were shown as part of the third annual exhibition of the Wanganui Society of Arts and Crafts. In December 1935 her work was showcased at Walker’s Galleries in New Bond Street, London. A contemporary press report records that this show included landscapes in watercolours that she and John had made whilst travelling in Europe and a collection of small flower paintings, among which were depictions of wild blooms from New Zealand, Australia and Italy. It is eloquent that both of these genres are represented in the Sarjeant collection today.